Lands' End Newsletters | The soda fountain downtown. For as long as anybody here can remember, the apothecary in downtown Dodgeville, the rural Wisconsin town Lands' End calls home, has been known as Corner Drug. The business has been in residence over 100 years - although there wasn't really a corner here till Merrimac street was extended to intersect the main drag back in 1927. There's a local legend about this. A former owner once served as county coroner, so perhaps the original name was Coroner Drug - or so the wags of our town like to speculate. The little store on the corner is more than just a place to get your prescriptions filled. 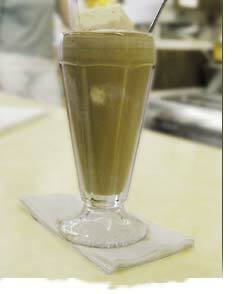 Corner Drug is home to an old-fashioned soda fountain of 1940s vintage. On the far side of the eight-stool counter up front sits the big stainless steel appliance. Tidy rows of pumps to dispense the assorted flavoring syrups. Bins for all the toppings. And way up top, like a cherry crowning the perfect sundae, the gleaming goosenecks of the twin soda taps. The eight stools are frequently occupied by "the regulars." Leo, a retired meat cutter. Bud, described to us as "a retired IBM guy." (He's new in town.) Ole comes in - his son is one of the pharmacists. Lois from the school cafeteria. Mary, who's disabled, arrives on her electric scooter - but not if it's raining. Kids in the afternoon, after sports practice. Amy was tending the counter on the day we visited. She's been at this for only a couple of years. Pat, who works Monday-Tuesday-Friday, has 11 years of service to her credit. You don't earn your "soda jerk" wings overnight. First, you need to master the somewhat unusual ice cream scoop they employ here - a peculiar, pistol-shaped device that turns out block-shaped "scoops" with neatly squared-off edges. "Is there a name for that?" we ask. Amy laughs. "Old," she says. Here, they still know what a phosphate is... and they can make you one worth telling your grandchildren about. Somebody may even request a "green river," an old-fashioned emerald-dark refresher made with lime syrup. But one especially well-loved attraction has been lost forever. That was Ruthie. Or, as Amy, put it, "Our poor little Ruthie who passed away a year ago - she was our real soda jerk." Ruthie was on duty for almost 20 years. There's a newspaper photo from 1993 - white-haired, diminutive Ruthie holding one of the chocolate sodas that earned her such a following. Many's the visitor to our locale who yearly made a pilgrimage to Ruthie's counter. Amy: "Right now, we're hitting the people who saw Ruthie last year and they're coming in to see her again. She was part of their vacation." The fountain itself may be living on borrowed time. Vital mechanical parts are becoming scarce. Amy: "We were told if the thermostat goes, there are no replacements." The Multimixer, too, is showing its age. "We have to soften the ice cream with a spoon... just to help it out a little." And maybe those hands-on touches are part of the magic. The day we visit, Amy whips up a strawberry malted for us. It's served in white paper cone, nestled inside a Melmac pedestal that resembles an outsize eggcup. ("If you know where we can get more, let us know," Amy quips.) The stainless steel mixing canister is set down on the counter next to us. There's another full serving inside - and you wouldn't want to miss a drop. High time, don't you think, to reclaim the casual workplace for the banner of elegance? We're ready if you are. We have tailored attire to show you at your best - in all your favorite fabrics, with thoughtful touches at every turn! Flattery and flair (and flare). Our STRETCH CORDUROY BOOT-CUT JEANS sit a little lower on your waist (about an inch below your navel), fall straight from the knees to create a subtle flare, and (important point here) in no degree resemble the pants your daughter might wear. Classic five-pocket styling is the hallmark of this STRETCH CORDUROY SKIRT. Plus, we've endowed the velvety corduroy fabric with a welcome bit of stretch - for that added extra "ahh!" More classic, comfortable clothing in our WOMEN'S 16W-26W STORE. Rummage through WOMEN'S 16W-26W OVERSTOCKS STORE for bargains. At 9 wales per inch, these PLAIN FRONT WIDEWALE CORDUROY TROUSERS, these cords exude a a countrified ruggedness, yet boast all the civilized refinements of your best tailored dress trousers. Built to "out-tough" your little tough guy. Boys work overtime to wear out clothes. In the case of these BOYS' OPEN-BOTTOM CLIMBER PANTS, they won't succeed. Credit goes to the double-stitching, reinforcing and system redundancy (i.e.,double knees). Tough-yet- plush 100% cotton 8-wale corduroy. Our DOUBLE-WOVEN STORAGE BASKETS will stand sentry-like at the backdoor, ready to receive mittens and scarves. In the bath, they'll keep towels at the ready. Next to the hearth to fill with firewood. Double woven of wicker lightweight enough for easy toting from room to room.